• The Lord Mayor’s Show is tomorrow. The world’s oldest civic procession, it’s been held for 795 years (the last time it was interrupted was due to the Duke of Wellington’s funeral) and commemorates the day when the newly elected Mayor had to make the journey from the City to Westminster to declare his allegiance to the monarch. This year’s Lord Mayor of the City of London – the City’s 683rd – is Alderman Michael Bear (not to be confused with the Mayor of London Boris Johnson). The procession kicks off at 11am and travels from Mansion House to St Paul’s Cathedral, where the Lord Mayor, who formally took office yesterday in a silent ceremony held at Guildhall, is blessed. The procession then moves on to the Royal Courts of Justice where the Lord Mayor swears an oath of allegiance before returning to Mansion House via Victoria Embankment. This year the procession will involve from than 6,000 people from livery companies, military units, marching bands, local schools and businesses and community groups as well as 200 vehicles, 21 carriages – including, of course, the Lord Mayor’s State Coach – and 71 floats. Don’t forget to hang around for the fireworks. For more about the event – where to stand and what you’ll be seeing, see www.lordmayorsshow.org. 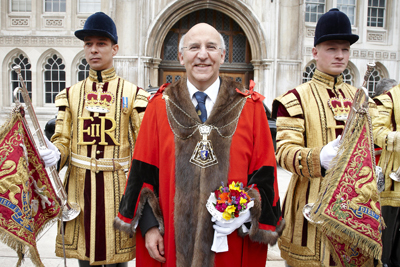 PICTURE: Alderman Michael Bear on the occasion of his election as the 683rd Lord Mayor of London. Courtesy Lord Mayor’s Show. • Now On: The British Museum exhibition, Journey through the afterlife: ancient Egyptian Book of the Dead, was launched last week. The exhibition centres on the museum’s collection of Book of the Dead papyri, many of which have never before been put on display to the public. They include the Greenfield Papyrus, which at 37 metres long is the longest Book of the Dead in the world and has never been displayed in its entirity before. The display also features famous paintings from the papyri of Ani and Hunefer and an array of painted coffins, gilded masks, amulets, jewellery, tomb figurines and mummy trappings. Runs until 6th March. For more information, including admission prices, see www.britishmuseum.org. • Now On: A new exhibition exploring the development of the English language opens today at the British Library. Evolving English: One Language, Many Voices looks at how the language has evolved from Anglo-Saxon runes to modern day rap and where it’s headed next. Highlights of the exhibition include the first book printed in English, Recuyell of the Historyes of Troye (printed by William Caxton), a 1611 King James Bible, Poor Letter H – a pamphlet dating from 1854 explaining why pronouncing your h’s correctly is important to climbing the social ladder, and the earliest surviving copy of Beowulf. On until April 3rd. Admission is free. For more information, see www.bl.uk.